1) we could not get good wifi on our back deck. If we had our door open, we got a sight unstable signal. With the AC on, we usually needed to keep that door closed, which all but killed the signal. One option was to hack my old routerlike this article suggests, and convert it into a repeater. The IT geek in me really wanted to try this. However, I know that since this isn't something I do every day, it would probably take me hours longer than the article suggests. 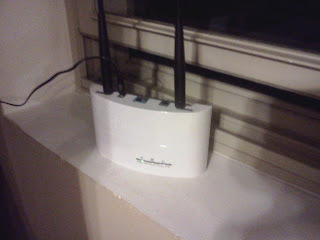 Instead I bought a repeater on the recommendation of a friend from the Low Rent Consulting Company days. Berwyn Boy knows his stuff when it comes to networking and I trust his recommendation. It cost $60 but it was money well spent because I didn't waste 2+ hours of my life attempting to acheive this hack. The sad thing is that I'm probably going to try when we get a house because I suspect I'll need more than one repeater and because I'd be a poor IT guy if I didn't try. So challenge accepted. 2) Through another LH article, I discovered Amazon Subscribe and Save. 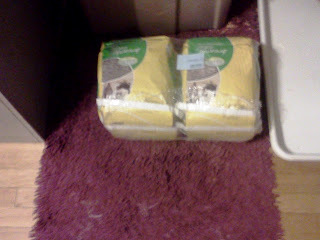 Changing the cat box has become my job and along with that comes buying the litter. Given that's one more thing to haul up two flights of stairs especially since we sometimes don't get to park on our block let along out front of our condo building, I decided to give this a test and ordered Kitty Litter. I read through the reviews at Amazon and there is some controversy over the type of litter they advertise and what they actually send. If you don't know this, cats can be somewhat picky about where they shat. There's also issues with dust and clumping and whatever. Basically the pet industry has figured out a way to make oodles of money on cat latrines. We are fortunate that the brand they ship meets our needs so once the first order I arrived, I upped our monthly repeating order to a full months supply. Yes it costs a little more than at Jewel but it's totally worth it. When we get the house, I may add other items like paper towels and toilet paper.